BOSTON (AP) — LeBron James made the go-ahead jumper with 10.5 seconds left to lead the Miami Heat to their 23rd consecutive victory, the second-longest streak in NBA history, with a 105-103 win over the Boston Celtics on Monday night. The Heat surpassed the 22 straight that Houston won in 2007-08 and trail only the 33 in a row won by the 1971-72 Los Angeles Lakers. James scored 37 with 12 assists as the Heat won in Boston in the regular season for the first time in 11 tries despite a career-high 43 points from Jeff Green. The Celtics were without Kevin Garnett, who has the flu and a left thigh strain. Paul Pierce had 17 points, eight rebounds and eight assists for the Celtics. But he missed a 3-pointer with 3 seconds left that could have given Boston the win. Mario Chalmers scored 21 points for Miami, which has not lost since Feb. 1. The Heat had not won in Boston since the New Big Three was formed — including the Celtics’ double-overtime victory on Jan. 27, when Ray Allen returned with his new team. That was the day Rajon Rondo was diagnosed with an ACL tear that ended his season. This time, it was Garnett who sat out, though coach Doc Rivers said he would have played if the thigh injury had not been compounded by the flu. 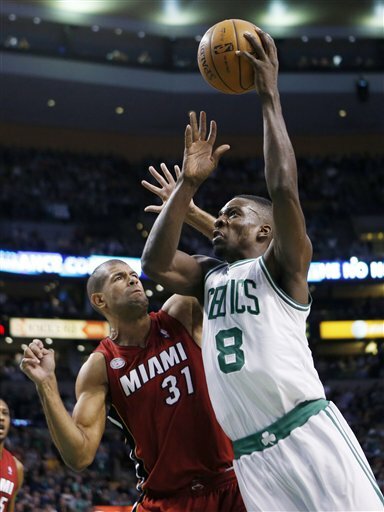 Boston led by as many as 17 in the first half, but it was 103-all when Miami got the ball with 33 seconds left. James dribbled down the shot clock before putting up a jumper from the right wing to take the lead. Green drove into the lane for Boston, but he was stuffed by Shane Battier; the ball went out of bounds and, after replay, was given to the Celtics with 7.1 seconds remaining. Courtney Lee found Pierce for an open 3-pointer, but it bounced long off the rim and Dwyane Wade, who scored 16, tipped the rebound to the corner and then grabbed it. The game came exactly five years — to the day — after Boston ended Houston’s 22-game winning streak. Green had 14 points in the first quarter, when the Celtics scored the last 17 points to open a 31-19 lead. Boston led by as many as 17 in the second, but Miami went on a 15-6 run just before the half to make it a six-point game and then scored the first eight points in the third quarter to take the lead. Notes: Green had 12 in the second quarter and 12 in the third. … Battier was on the Houston Rockets team that won 22 straight before losing 94-74 to Boston on March 18, 2008. … James was called for a technical foul for taunting when he stood over Jason Terry after a dunk. It was James’ sixth technical of the season and the 39th of his career. … Pierce and Chalmers got involved in a minor scuffle when Pierce drew an offensive foul and Chalmers tried to grab the ball from him after the whistle.